The Congressional Budget Office's (CBO) recent ten-year budget projections show that debt is on course to exceed the size of the economy in just over a decade. Over the long term, debt is on course to rise much higher. 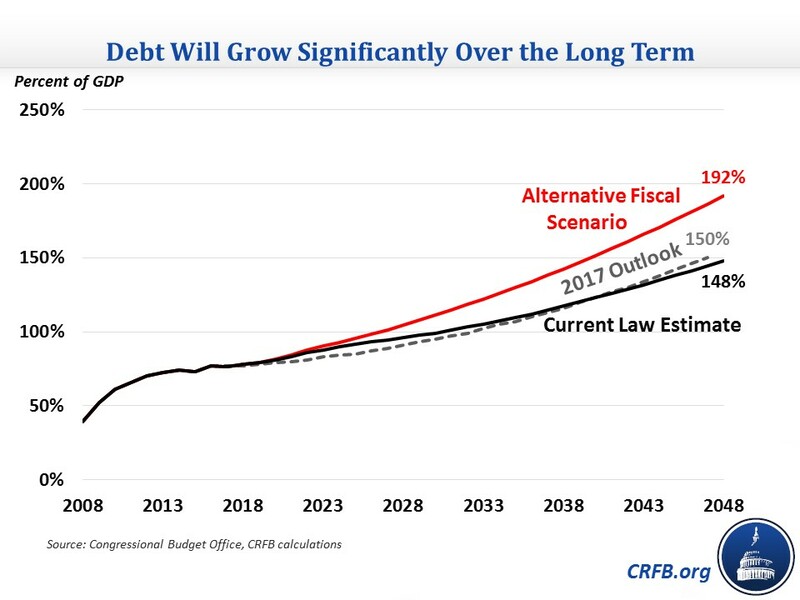 By our estimates, debt will reach about 150 percent of Gross Domestic Product (GDP) in 30 years under current law and over 190 percent of GDP under CBO's Alternative Fiscal Scenario. In other words, debt is on track to be double the size of the economy. To avoid this unsustainable debt growth, policymakers would need to identify spending cuts and tax increases totaling 2.4 to 5.1 percent of GDP per year. CBO's latest projections only go out ten years; however, we have our own long-term model that bases future budget trends on CBO's previous long-term budget outlooks. While current debt levels are high largely due to the Great Recession and near-term debt is growing as a result of irresponsible tax cuts and spending increases, the aging population and rising health care costs will likely drive debt to new record levels. By our estimates, debt held by the public, which totals about 77 percent of GDP today, will reach the size of the economy by 2030, exceeding the all-time record of 106 percent in about 15 years and reaching 148 percent in three decades under current law. Despite the large near-term increase in debt, the 2048 total is actually slightly smaller than last year's outlook. That's because near-term debt increases are largely due to temporary and expiring policies, while the adoption of chained CPI to inflation-index the tax code generates increasing revenues over time (GDP is also slightly higher than in last year's estimates). Importantly, though, few policymakers expect or intend for the recent tax cuts or spending bill to be temporary. If they were made permanent as CBO assumes in its Alternative Fiscal Scenario (AFS), the situation would look much worse. Debt would exceed the size of the economy by 2027, break the all-time record by 2029, and exceed 190 percent of GDP by 2048. At that pace, debt would be double the size of the economy by mid-century. Importantly, even the AFS may be overly optimistic; it assumes various new tax increases will take effect in future years and that lawmakers will allow revenue to rise and discretionary spending to fall indefinitely as a share of GDP. It also assumes no severe economic effects from such high and rapidly rising levels of debt. One way to quantify the country's long-term fiscal situation is by measuring its fiscal gap, or the amount of non-interest deficit reduction needed each year to achieve a given fiscal target. Under current law, stabilizing the debt at its current post-World War II record level of 77 percent of GDP would require deficit reduction of 2.4 percent of GDP per year over three decades (the equivalent of $6.1 trillion over ten years). Reducing debt to its historical average of 40 percent of GDP would require 3.6 percent of GDP (the equivalent of $9.2 trillion). 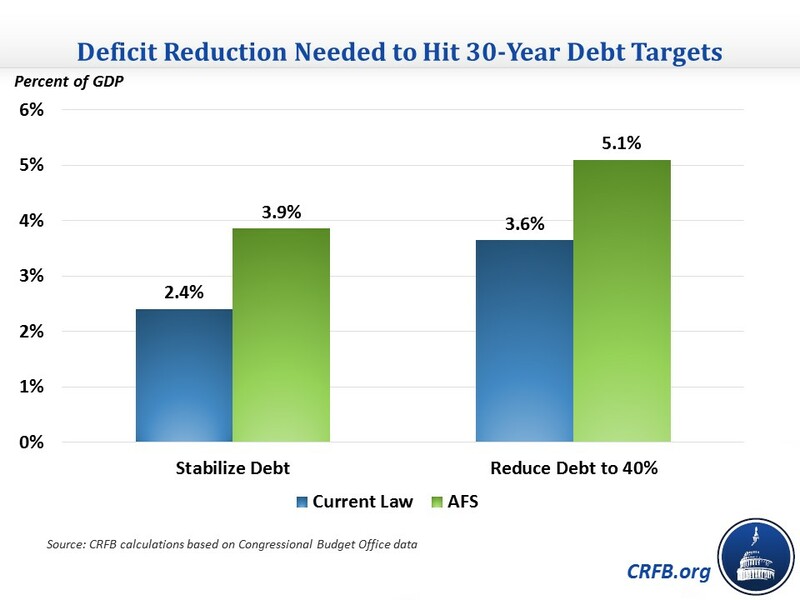 Under the AFS, there would be a much higher fiscal gap of 3.9 percent of GDP (the equivalent of $9.7 trillion over ten years) for stabilizing the debt and 5.1 percent ($12.9 trillion) for reducing it to 40 percent of GDP. The long-term outlook, like the ten-year outlook, shows continuously rising debt and significant deficit reduction needed to make debt sustainable. Lawmakers will need to get to work quickly to make that happen.